In the robust agricultural and equestrian countryside of Valley Forge and Brandywine Valley is a honeymoon cottage for a single family from Washington, DC. 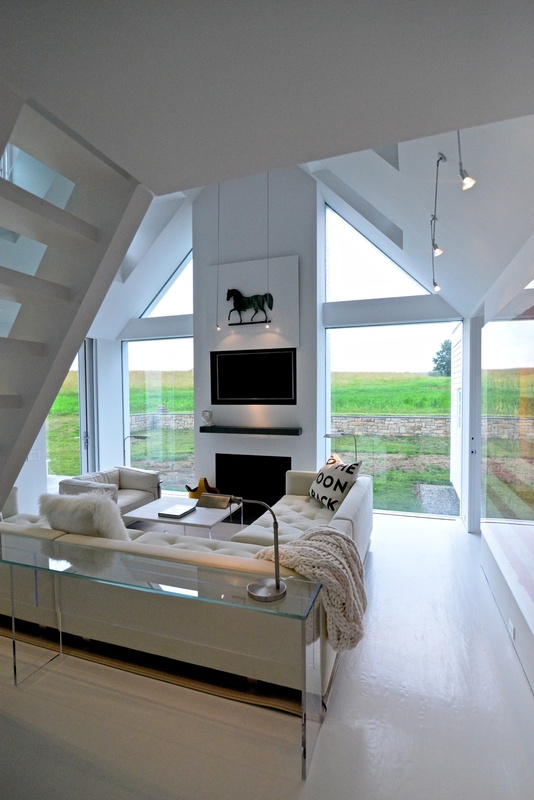 It is an addition to a main family residence originally built in 1710. Nine hundred square feet, two bedrooms, two bathrooms and a light kitchen, the house is ideal for visiting guests, children and grandchildren. The very deliberate forms are a reflection of the area's rich farm and horse culture as well as a social order of fine buildings. The Society of American Registered Architects-Pennsylvania Chapter. "Pennsylvania’s Brandywine Valley—a bucolic swath of rolling hillside just south of Philadelphia—was home to some of America’s most venerated families, among them the duPonts and the Wyeths. 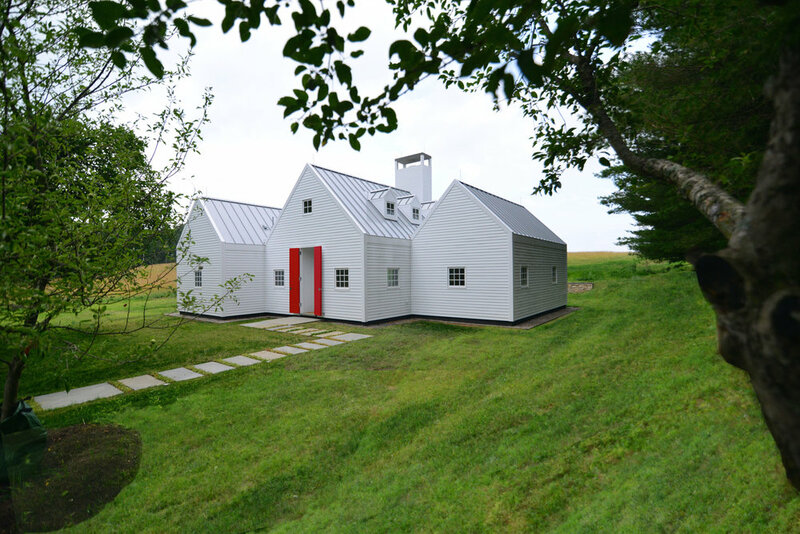 Its pastoral charms made it the logical location for Simon Jacobsen’s latest project, a modern, Shaker-style farmhouse that reflects his penchant for combining contemporary structures with the natural beauty that surrounds them. When a Washington, D.C.–based couple with an extended family approached Jacobsen to create a 1000-square-foot guest cottage behind their 18th-century stone manor, he jumped at the chance. It began as a birthday gift idea from the wife, an executive who works in global refugee issues, to her husband, a retired energy consultant. She approached Jacobsen with a request for informal plans. “The program was simple,” Jacobsen says: two bedrooms, two bathrooms, a kitchenette, living room and sleeping loft for future grandchildren. 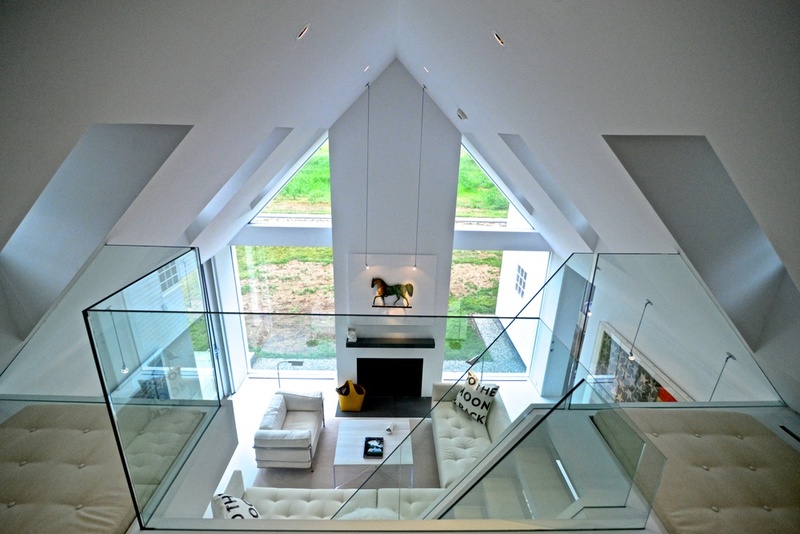 The architect was pleasantly surprised when the couple returned to his studio a year later, ready to start construction. 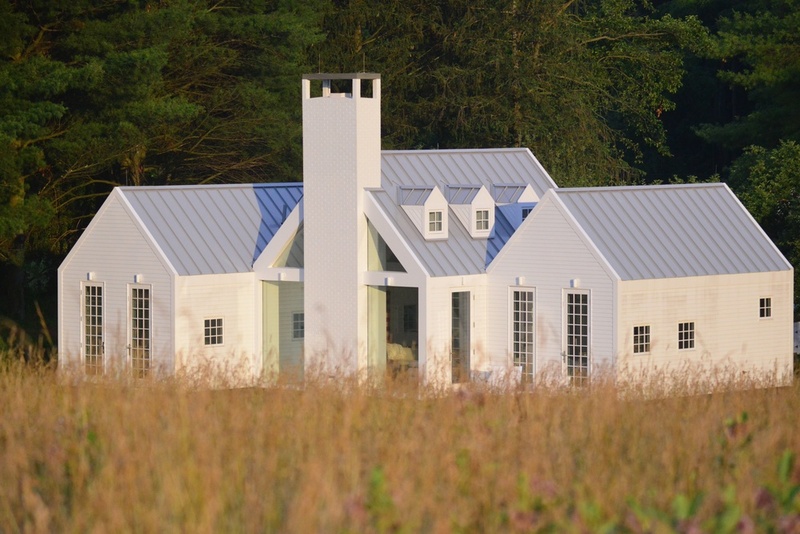 Sparse detailing—liberal use of glass, full-height doors, no crown or base molding, disguised electronics—creates an immersive rural experience. “Every turn is a surprise,” says Jacobsen. “Especially when you walk in the front door.” The doors are painted red on the inside and white on the outside, a nod to the Shaker tradition of a farmer alerting the community that a daughter of marriageable age resides in the home. “The owners were enchanted by this, and it was one of the first things we discussed,” says Jacobsen. Inside, the couple’s collection of folk art and photography enjoys prominent display. The result is a breezy, contemporary guest cottage with large windows that lead your eye to the top of the hill and beyond."